What a charmer this place is. This petite ice cream shop in Sant Gervasi is owned by childhood friends Matteo, Gianluca, Marco and Francesco, bringing the traditions of their hometown of San Remo to Barcelona. Named “street gelato” for their cute-as-a-button ice cream trolley, which they take on the road to local festivals and events, whips up artisanal gelatos, sorbets, and popsicles quirky enough to cater to everyone’s tastes. Using seasonal, local and organic ingredients, they offer an amazing rainbow of unusual savory and sweet flavors: saffron, yogurt with curry, Parmesan balsamic, licorice, cava peach, vermut, pineapple basil, and clara (lemon beer! ), just to name a few. There are also the classics for the less adventurous. 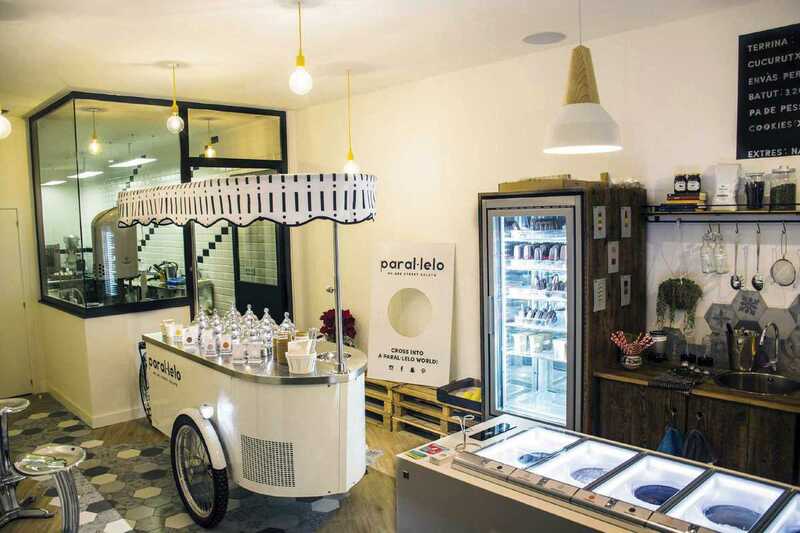 Paral·lelo is definitely worth the trip above Diagonal, but if you can’t make it all the way up there, one click on your Glovo app is all it takes to get some of the best gelato in town to your doorstep.